You are here: Home > Why is Health Insurance Expensive? 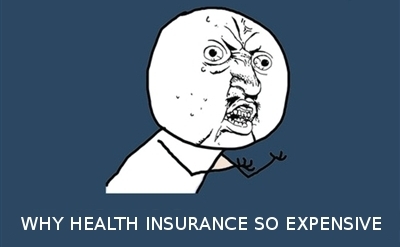 Why is health insurance expensive? As per a survey by CDC’s health insurance coverage survey 45.5 million Americans were without health insurance in 2012. This means a good 12% of American population is without any health insurance cover. Cost of health insurance is the major culprit. Americans spend more than 2.5 times the OECD average on healthcare. Cost of health insurance for an individual has increased from $3083 in 2002 to $5615 in 2012. For a family of four it has increased from $8003 to $15,745 in the same period. The table is taken from Kaiser Family Foundation shows the increasing cost of health insurance from 2002 to 2012. Let’s explore some reasons for high cost of health insurance cover. As per OECD health data America spent $2.54 trillion on healthcare or 17.3% of US GDP in 2010. Per person health care expense was $8,233 in 2010. Americans spent $1.2 trillion from their own pocket on health care while the public spending was about $1.34 trillion. These numbers will give you some idea how expensive health care was in 2010. Experts believe American healthcare expenditure to be $3.5 trillions in 2013. Since 1970 healthcare costs have grown 2.4% faster than GDP growth. The above paragraph would have given you some idea why health insurance is expensive. Let us see the reasons that have led to high cost of healthcare and hence high cost of health insurance. Technology is the reason number one for expensive health insurance. US is at the cutting edge of medical research. Medicine loves technology. From MRI scans to robotic surgeons, it is difficult to imagine modern healthcare without technology. A MRI machine may cost upwards of $1 million. High input costs moves prices up. Since 1960 technology has contributed about 50% of the increase in cost of healthcare. Only about 38% of US population has a primary care physician. Primary care physician acts as a gatekeeper between the insured and the health care. HMO insurance covers typically have a lower premium than PPO insurance cover. In PPO models the insured is free to go directly to a specialist. This increases cost of health insurance. Americans rely heavily on specialist care. Even in cases when it is not required. We spend 3 to 6 times more on specialist doctors. Visit to a specialist also results in more complex examinations further increasing the cost. Obamacare will increase health insurance premium for the young and healthy. As per provisions of ACA health carriers will not be able to reject applicants with adverse medical histories. Since health insurance companies will not be allowed to cherry pick members. To compensate carriers will increase premium for younger members. As per CDC 7 out of 10 deaths in America is because of chronic diseases. in 2005 133 millions or one out of two adults had at least one chronic condition. Obesity, heart disease, cancer, and diabetes are the most worrisome chronic diseases. Chronic diseases require care for long periods or entire life. This increases the cost of healthcare and as a result health insurance. 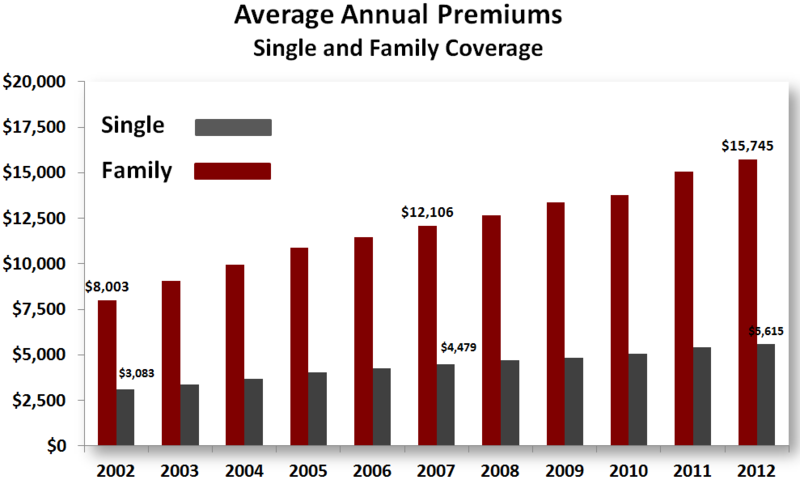 Cost of family health insurance has increased at an annual rate of 8% between 2002 and 2012. It is expected that health insurance companies will give another price jolt from next year. There is nothing much we can do except search for the cheapest best alternative.